From April 2016 the reporting of ‘Flexibly accessing pension rights’ via RTI has become mandatory. This guide shows how to enter the details of these payments into Payroll Manager in order to report correctly to HMRC. Moneysoft is not able to advise on whether such payments are taxable / non-taxable, and you should consult HMRC if you require further guidance. HMRC Pension Schemes Newsletters give more information about the reporting of these payments. If you have not already done so you should create an ‘addition’ for each payment type . Go to the ‘Pay Details’ screen and click on the ‘Additions’ tab. Click on the ‘blue spanner’ symbol at the top of one of the columns (the exact column headings will vary according to your use of the software). 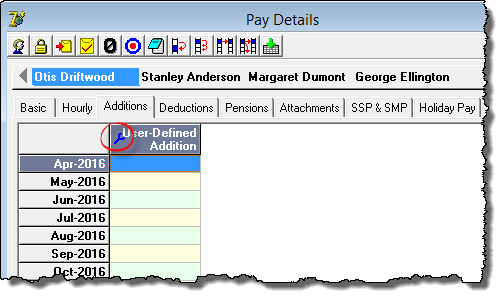 Create a new addition type i.e tick the box marked ‘Used’, add a suitable description, and specify whether the particular payment is subject to tax and / or NIC as appropriate before clicking ‘OK’. If you have more than one payment type then you should create a new addition for each. Enter the payment amounts in the relevant column(s) on the Pay Details screen. 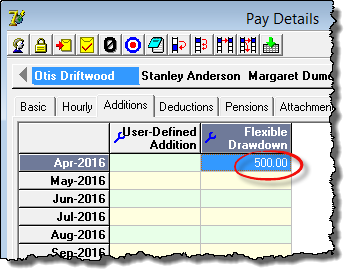 Click on the ‘Adjustments’ tab on the Pay Details screen and enter the total payments for that employee in the relevant column(s). HMRC require that your RTI submission includes the indicators ‘FlexiblyAccessingPensionRights’ and / or ‘PensionDeathBenefit’ as appropriate, depending on the types of payment made. 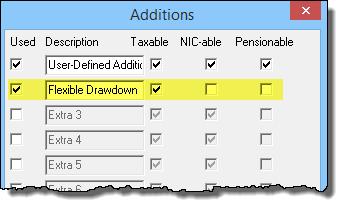 Payroll Manager automatically includes these indicators according to which column you have used to enter the adjustments. These indicators are not shown on the RTI report, but will be present in the underlying xml data sent to HMRC (see example below). © 2019 Moneysoft Ltd. All Rights Reserved.